Update: Construction of the Central Sewer Extension was completed in the spring/summer of 2017. In 2016, the City undertook a legally required expansion of the Central Sewer line along a designated area between Hatley Park Mall on Sooke Road and a section of Metchosin Road (marked in green and orange on the map). At their meeting on October 11, 2016, Colwood Council approved the awarding of the contract for the construction of the central sewer expansion. The contract was awarded to C-1 Contracting Ltd. In the amount of $1,059,136.00. 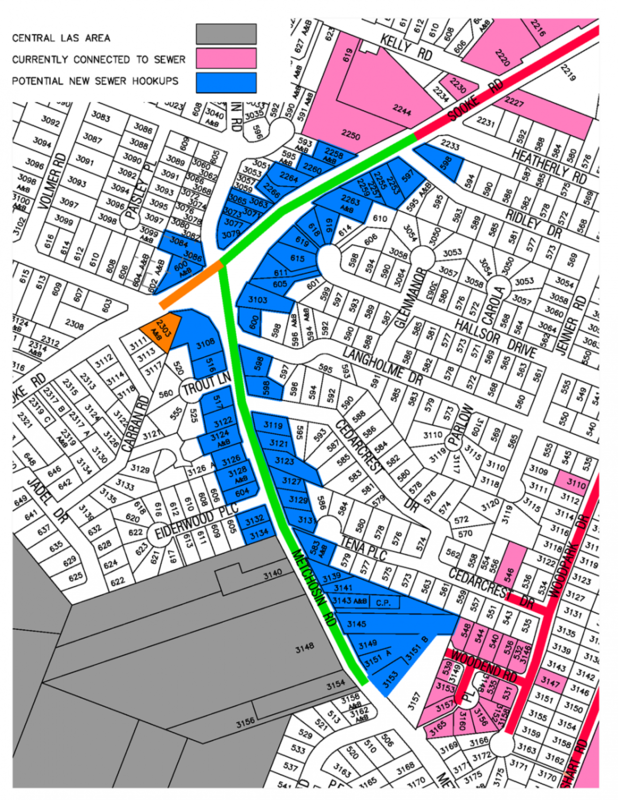 Property owners adjacent to the extended sewer (those marked in blue on the map) were presented with the opportunity to connect to sewer service. Petition letters were sent to all property owners with instructions to take no action if they wanted to be included in the expansion of the sewer service area, or to sign and return the petition against the initiative indicating NO if they did not want to be included in the expansion to connect to sewers. The counter petition process - against the initiative to expand the main and central sewer local services areas - was successful, meaning that the majority of property owners chose NOT to join the Central Sewer Local Area Service at this time. However, any property owners who wish to join the Local Area Service to allow for sewer service connection may still petition the City to join by contacting the Colwood Engineering Department at 250-478-5999 or info@colwood.ca. Affected property owners were invited by letter to a meeting at City Hall on Wednesday, March 30, 2016 to learn more about the background and options related to the Central Sewer Expansion. Q1. Why is the City undertaking the Central Sewer Extension at this time? This sewer extension is required as part of an agreement between the City, the province and others as part of a legal settlement. Read more about the history of sewer service in Colwood in the Sewer Backgrounder. Q2. Will the City construct the sewer line either way - whether property owners opt in or not? Yes, the City will be constructing the Central Sewer Extension in 2016. Because this work is happening, the City is offering adjacent property owners the opportunity to join the Central Local Area Service (LAS), allowing them to connect to sewer service. Q3. What is a Local Area Service? A Local Area Service is a designation in the Local Government Act that allows for a specific part of a municipality to receive a specific service. Read more about Local Area Services on the provincial government website. Q4. Why is the City using a "counter petition" process that assumes property owners agree unless they indicate no? Why not force people to respond if they do want to join? The petition process is a legal process which is laid out in the Local Government Act. The counter petition process is strictly dictated by an agreement between the City, the province and others as part of a legal settlement. Q5. When will petition letters be mailed out to property owners? The City plans to distribute petition letters near the end of April. Q6. Will property owners pay taxes if the petition does not go ahead? No. If the petition is not successful, property owners will not join the LAS and there will be no sewer tax applied. Q7. If property owners join the Central LAS, will they pay sewer tax forever? No. The tax is based on the amount of money the City must borrow to construct the sewer. Once that amount is paid off, the property tax is no longer charged. The payment period on this project is 28 years. Q8. Will the amount of taxes property owners are required to pay increase over time? The tax amount is based on interest rates and is locked in for 10 years. After 10 years, if there is a change in interest rates, the tax rate could change. Q9. If a property owner currently defers their taxes, will they be able to defer the sewer tax as well? Yes. For those who qualify for tax deferral, the sewer tax can be deferred as well. Q10. What is the cost to connect to sewers? The cost for the City to construct a connection to the property line is $9100, which includes $6000 for the work and a $3100 sewer enhancement fee. The property owner must then create the connection from the property line to their home, which typically costs between $3000 and $5000. Q11. Where will the City sewer connection be located on my property? The City will bring the sewer connection to your property line. Consideration will be given to place the connection at the most convenient location on the property. Q12. Why does it cost so much for the City connection ($9100) which is much shorter than the connection on the property, which only costs $3000-5000? The cost of the work to create the City connection is a flat rate $6000. There is an additional $3100 sewer enhancement fee. Q13. What is the advantage to hooking up to sewers? Property owners have individual reasons for wanting to hook up to sewers. Some feel it is beneficial to be in the LAS so that they can hook up in the event of septic field failure. Some people feel it will increase the value of their home as sewer service is seen as an advantage to many home buyers. Q14. Is there any financial advantage to joining the LAS now? The City is working to determine whether there could be savings based on the fact that all the connections could be created when the sewer line is constructed. That information will be provided before property owners must make a decision. Q15. Can a duplex create just one line to serve both sides of the building? No. Each separate dwelling must have its own sewer connection. If you own your property, you must have your own line. Q16. What is the timeline for construction of the sewer extension? The City aims to have the sewer constructed before the winter of 2016. Update October 2016: No contractors were available to complete the project during this time frame, due to the volume of construction taking place in our region at this time. The contract was awarded with an extended timeline to accommodate the availability of tradesmen. Have additional questions? Don't hesitate to contact us. What City staff were at the meeting?